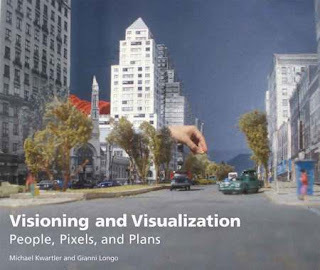 Visioning and Visualization: People, Pixels and Plans is based upon a series of workshops over the last five years at the Lincoln Institute. Michael Kwartler and Gianni Longo document principles, techniques, and cases based on their professional experiences in developing sophisticated public involvement processes that are used to apply information technology to planning and design. They suggest ways that digital visualization tools can be integrated in a public process to present participants with clear choices and help them make informed planning decisions. Evidence from communities throughout the country shows that public involvement supported by visualization leads to better plans and more livable places and communities. From the application of 3D Tools to the development of master planning initiatives the book, through its use of glossy images and well laid out text, illuminates the subject and provides a glimpse of the level of innovation used throughout the workshops. Chapter 4 on Visual Simulation Tools, takes a more detailed look specific tools and their uses in planning, such as representing existing conditions, visualizing alternatives, and monitoring impacts. Exploring the use of Community Viz and various rendering techniques to communicate a sense of location and place to the local community it provides a guide to best practice. These issues are introduced in the context of the origins of geographical information systems, developments in computer-aided decision-making and a look at the principles of decision making in general. It is all very well having these tools to hand; the key is in their implementation, as the authors state, a plan created with strong public involvement establishes the context for implementation in three important ways. Firstly, it articulates the values of the community, secondly it translates the values into an agreed-upon and preferred sense of place and finally it stimulates a sense of ownership for the plan, which in turn translates into support for its implementation. A sense of ownership at any level of community planning is essential to ensure the public not only feel part of the planning process but also to feel as if their views are valued. Trust from communities is there to be earned and by introducing digital means the communication process can be eased with the ability to easily integrate the communities views into planning options in real-time. The use of 3D GIS within a public environment is still far from the norm, especially in a UK context, indeed it could be argued that techniques to involve the public in the decision making process have declined in recent years. There is therefore a need for the lessons, through the case studies documented in this book, to be learned and built upon to ensure use the latest digital toolsets are used in new and interesting ways. In a world of Facebook, Flickr, YouTube and others allowing communication and visualization with increasingly greater ease those involved in the planning process are perhaps more than ever in need of techniques to reach out to the public at large in an open way. In short – we really liked it – see The Lincoln Institute of Land Policy for more info.